In 1849, Charles Tazewell built a building on the west side of Kimball street near the Kimball street bridge, where he opened a brewery. He would eventually sell it to German-born Casper Althen in 1868, who ran the business alone for many years. In the early 1890's, his three sons, Louis, Emil and Edward would join him in the business. 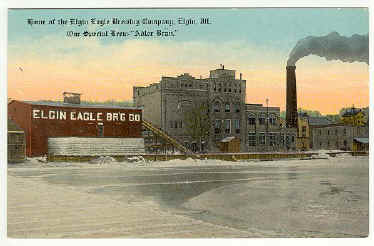 Around that time, the business took on the name "Elgin Eagle Brewery". By 1891 the business was a full-time operation, and Althen employed 15 workers. His brewery would produce between 5,000 and 6,000 barrels of beer a year, with "Casper's Superior" being one of the most popular. 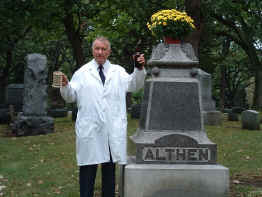 The Volstead Act (AKA Prohibition) would sound the death knell for Althen's business in 1920. The sons would retool the operation and, for a short time, distribute root beer, and ice cream. The building was demolished in 1963, having been vacant for over 40 years. It was reported as being one of Elgin's first landmarks.